Heavyweight, functional trivet is travertine stone covered with gray-blue, highly fibered Korean hanji (mulberry paper). 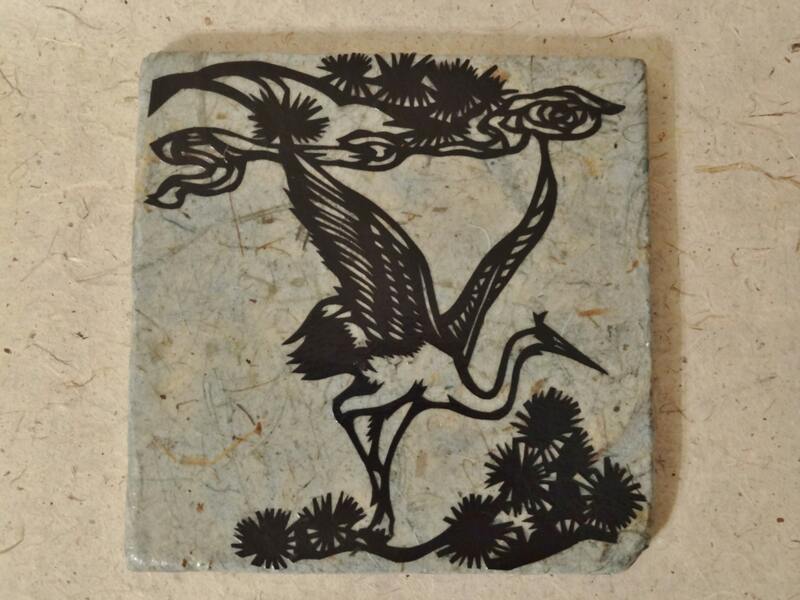 The design is a traditional, intricate hand-cut crane, also cut from Korean hanji. The trivet can handle a dish right from the oven. Wipe with a damp cloth to clean. Cork back protects your table or countertop. Add a gorgeous touch to your table, or give as a gift for a wedding, holiday or birthday. Wonderfully detailed and crafted! Purchased this as a gift for my mother and she loved it! Beautiful and strong, as advertised. Fast shipping. Thank you! Well packaged and perfect for my office! Love it!